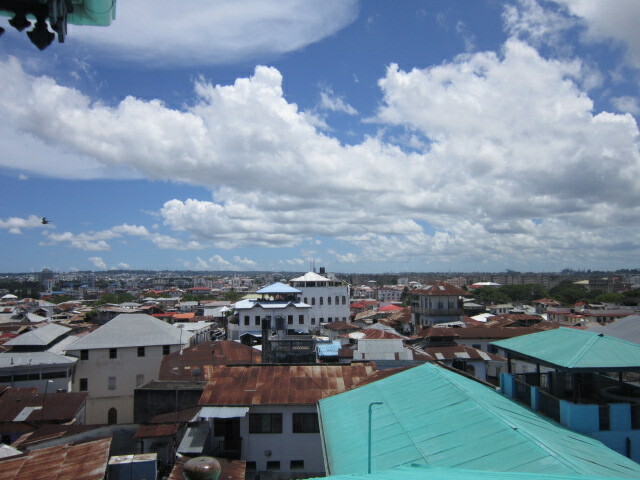 Sadly I was down to my second last day in Zanzibar. Luckily, I had met Razak, who promised me a fantastic day out that I would remember. When I had met Razak the day before down by the waterfront, he struck me as an amazing young man. Like my other friends that I had made, he was Muslim, unfailingly polite and respectful. But he was also different. I really can’t describe the difference other than he is a young man going some place in the world. Although he is currently working in a restaurant, he is on stand by for a job at the Zanzibar Airport where he will be on the counter checking guests into flights. That will be a great job for him as he is so personable, speaks several languages fluently and is just a good person. I would not be surprised if he ends up in a much more significant position with an airline. His education is in information technology but he is definitely a people person. 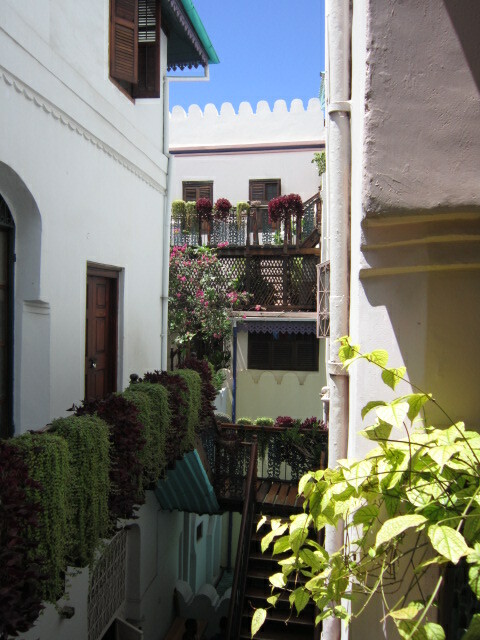 The day that he had planned for me was to visit some of the other sites in Stone Town that I had not seen so far and the promise of an ocean breeze and beach. 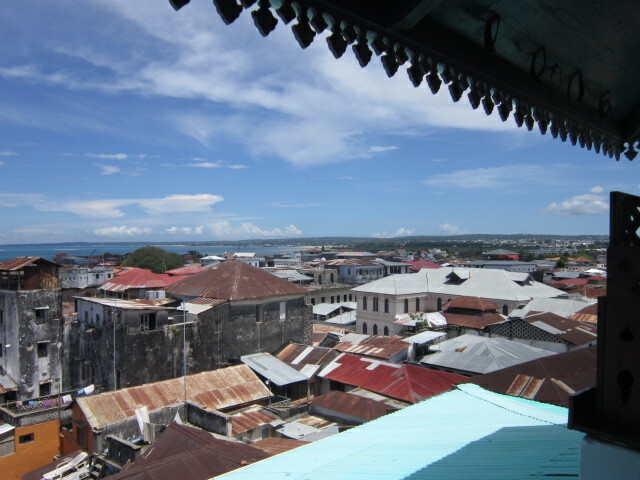 We started with a visit to the Hotel 236 Hurumzi, which Razak swore was the best ariel view of Stone Town on display. What I didn’t know when I agreed to the visit was that the only way to access the roof top was to climb the stairs….let’s just say poor Razak had to be very patient with me. As he is so young and fit he was able to bound up them no problem. I on the other hand truly struggle with stairs because of my ankle which he knew nothing about. And once I finished the climb (not thinking about how I was going to get down as that is always harder for me than going up) it was definitely worth the effort. 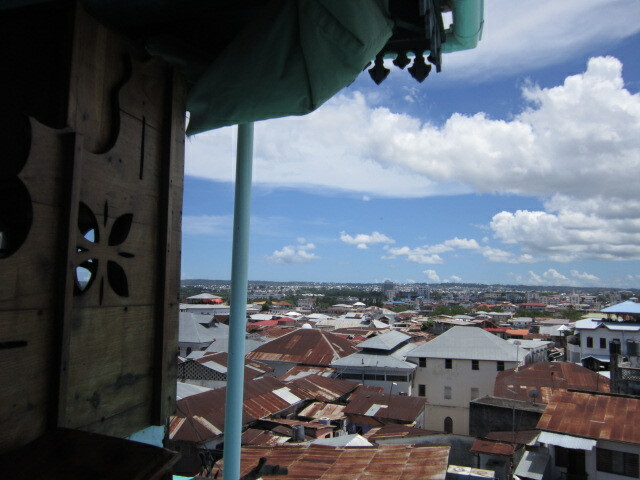 Plus there was a bar/restaurant on the top where you could stop and rest. On the way down, which we took very slowly and Razak diligently ensured that I did not fall on the stairs. He suggested that I stop and take this picture. He even offered to take my picture lounging on it! 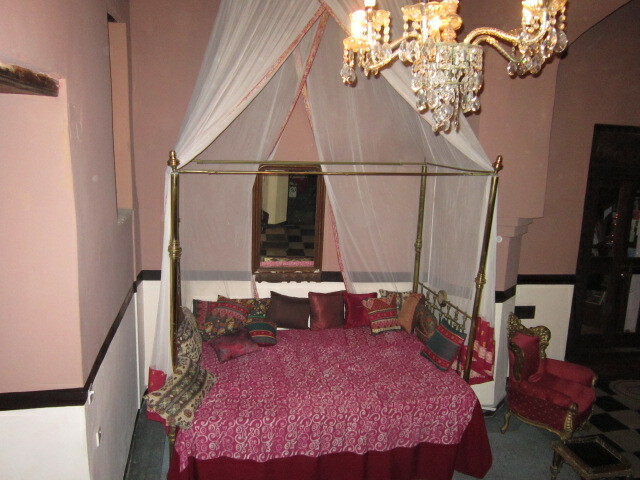 I declined because if I snuggled into I was sure that I wouldn’t want to go anywhere else. Give me a book and something to drink, I could have stayed there all day. Who cares if it was on a landing with people coming and going. 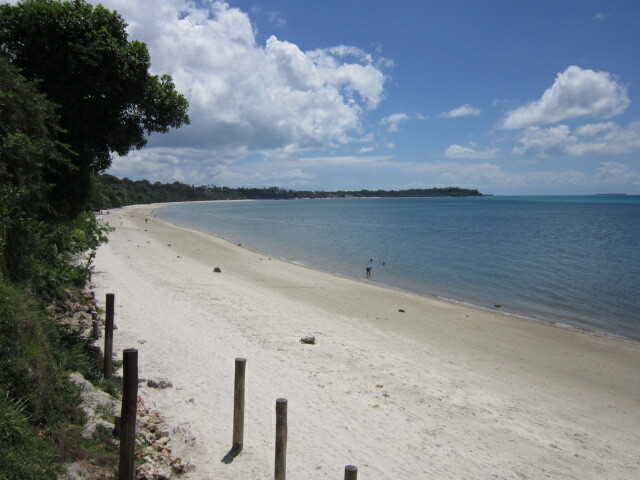 After visiting a couple of other sites it was time to head for the cool breeze and beach that Razak had promised me. It was very exciting as we were going to travel there on a dala dala. Fortunately we were on before it filled up completely so we actually had a seat on the wooden bench that runs around the whole inside. Quarters were very close as we were practically sitting on top of each other. I was jammed in between a very young girl and an older man. To keep my balance as we rounded corners I needed to place my hand on the ceiling above me to brace myself. It was insanely fun. For somebody who is driven to work everyday by the nicest calmest man I have ever met, it is hilarious how much I enjoy noisy crowded public transportation in exotic locales. 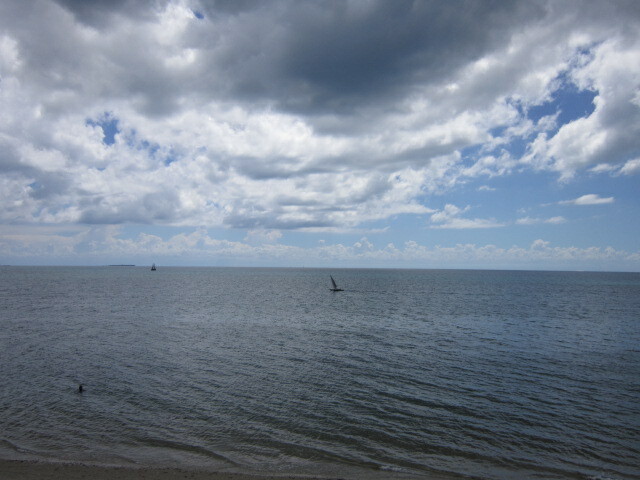 Following a twenty ride, we disembarked and Razak led the way to the Zanzibar Beach Resort Hotel. But first he had to ensure I wasn’t run over in the street. Remember, traffic can be crazy here and if you don’t pay attention all of the time you could find yourself in trouble. Not that I would ever get into trouble. After a considerable walk through and across wooden boardwalks suspended above a valley, we emerged into the Resort’s restaurant and bar area which sat suspended over the beach directly on the water. Just as he promised, there was the nicest breeze flowing through. Sitting there enjoying the breeze and the sea air was lovely. The food was great. I had Zanzibar Prawn Curry. Just thinking about it makes me want it again. It was so delish. 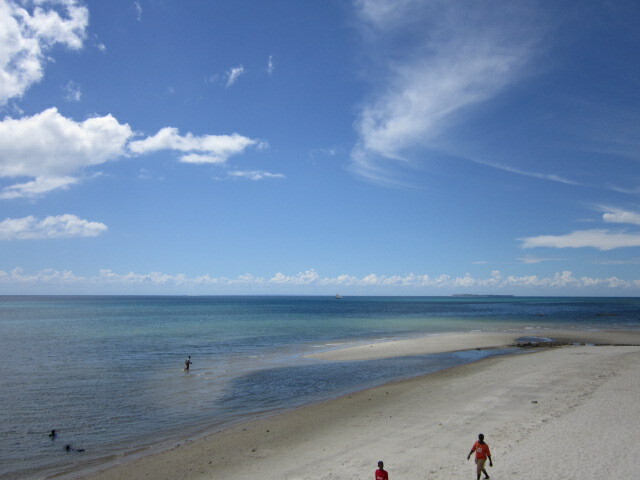 I couldn’t help remarking as we strolled back along the beach when we met several men running on the beach. You have to be certifiable to run in 40 degree heat and humidity. 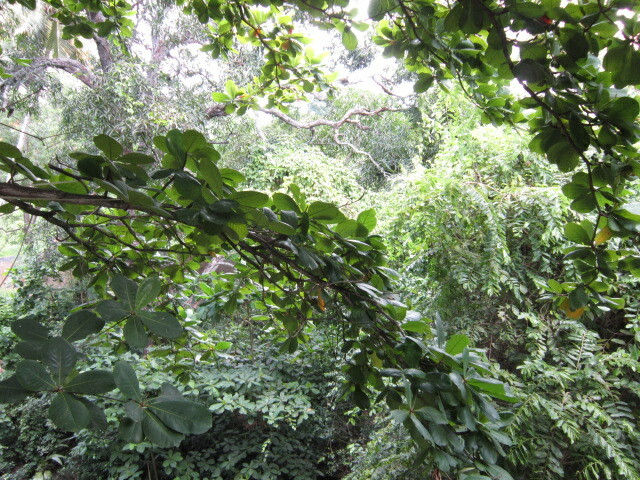 Instead, Razak and I sat underneath the shade of a tree and relaxed. 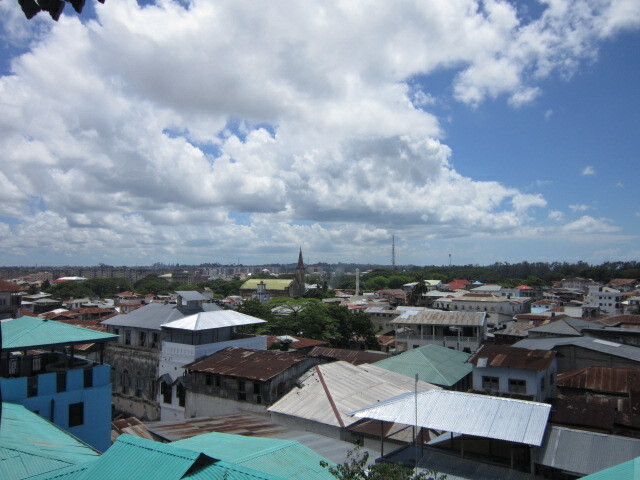 Finally it was time to leave the resort and make our way back to historic Stone Town. 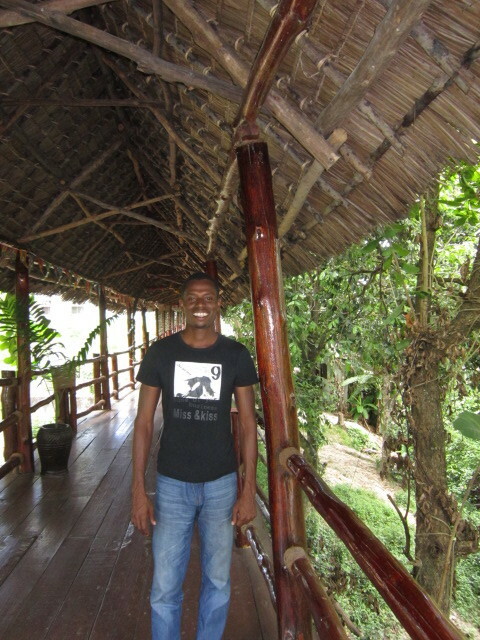 This time along our walk back through the suspended boardwalk I took Razak’s picture along with others. 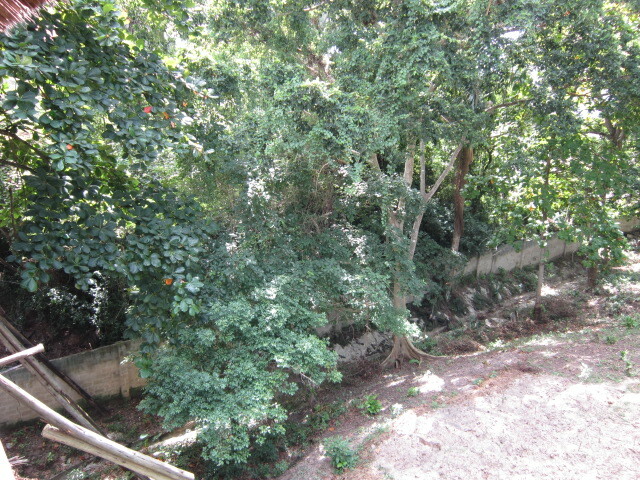 Razak, informed me that the sides of the ravine that we were suspended over were being prepared for planting by the locals. It accomplished two goals. 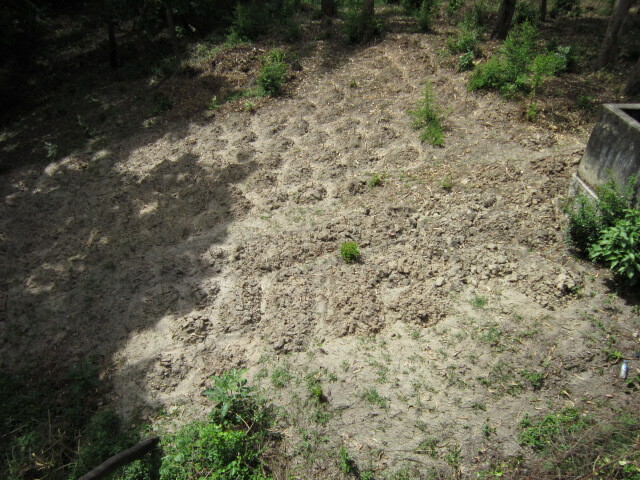 One, protected the soil from wash out when the heavy rains came and two, provide vegetables for the local families. Smart thinking. 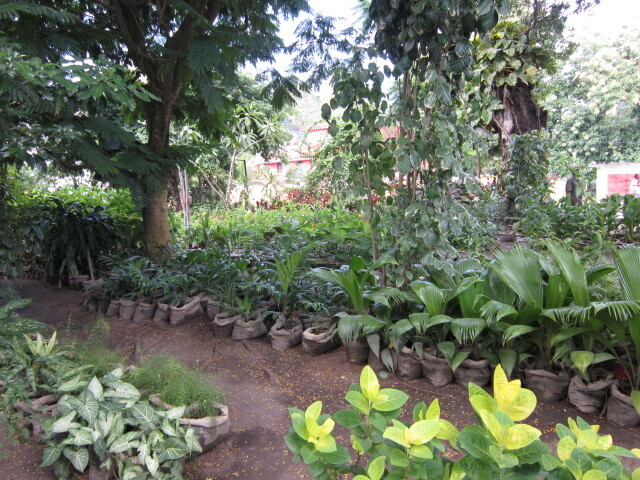 As we emerged back out onto the street I noticed a nursery. Razak proved what a gentleman he was as when he saw how delighted I was by it, he arranged a personalized tour of it for me. Man, did this young man ever know how to make me incredibly happy. 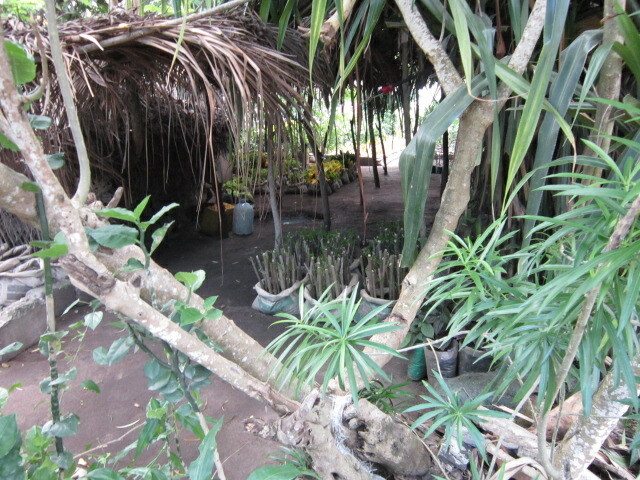 A beach, a tummy full of seafood and a garden nursery full of exotic plants. Oh, and who can forget the rides in a dala dala. Cheryl was one happy camper! But he promised me one more perfect experience to end off the day. A moonlight visit to a grassy park in front of Africa House where we could feel the cool night breeze while watching the almost full moon. Plus, he promised that I would see shooting stars. So a date was made for later on that night. After being safe returned to my hotel (these incredible men, everyone always walked me right up to the front steps of the Maru Maru) I got out of my wet clothing, showered and headed for the hang out corner. By now it was late afternoon so I spent the rest of it hanging with Saidi, MD and Maki along with various and sundry others. 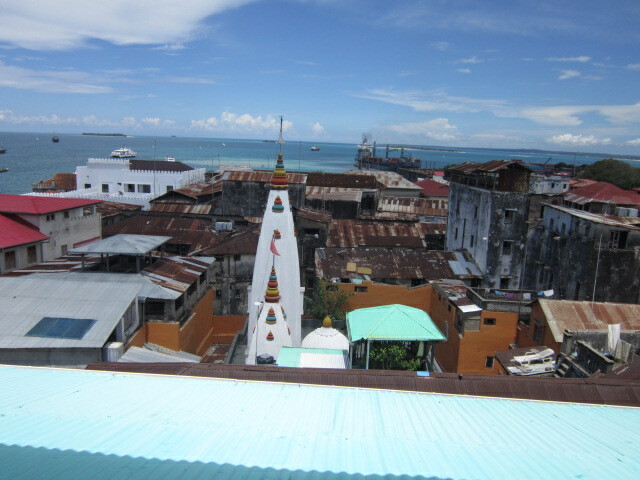 Once again talking about women’s rights, development on Zanzibar, politics, you name it. The discussion was so great that we continued it over drinks and snacks. MD, even joined us after securing the okay from his wife who had recently given birth to their second son. MD puts in such a long day with his shop and doesn’t get that much time at home with his family so I was honoured that he took a couple of hours to join us. Arriving back at my hotel escorted by Saidi at 10:30 pm the hand off to Razak was made. Aren’t I a tart? The evening ended perfectly with a seaside view of the full moon and yes, in deed I saw shooting stars. And what was even more impressive was that the security patrol stopped to check on me to ensure that as a tourist all was well. 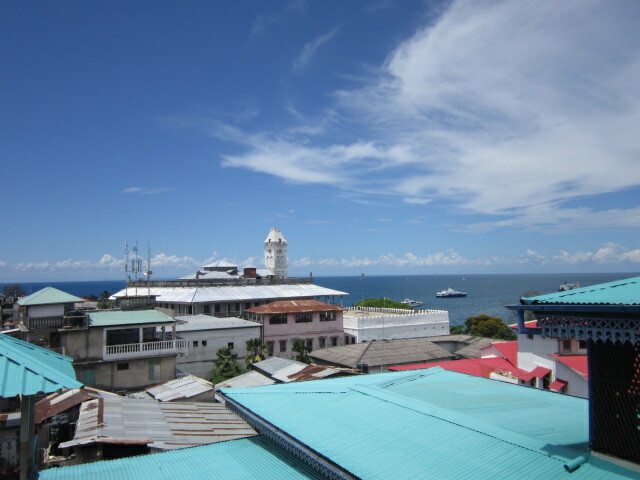 So now you know why I think Zanzibar such a wonderful holiday location. 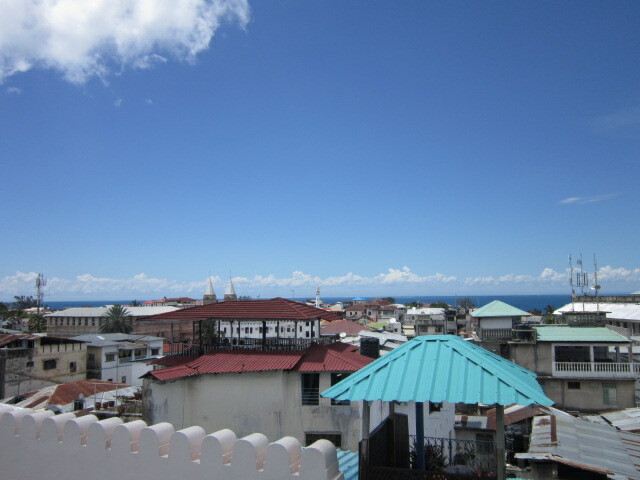 Zanzibar – wow, wowie, wow, wow, wow!!!!!!!!!!! !